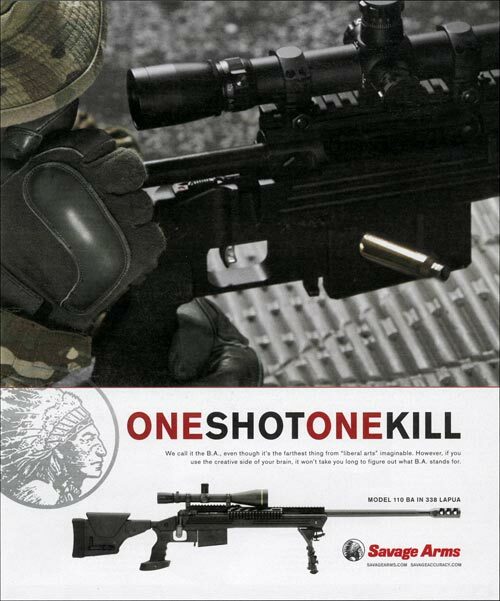 I gather Savage Arms is a company that makes or made deadly weapons with the slogan "One Shot, One Kill." As you can see, their logo is a stereotypical Indian chief. The inescapable conclusion is that Indians were killers just like the guns. This is exactly as false as Indian mascots and other stereotypical representations. It sends the same negative and arguably racist message: that Indians are primitive people of the past, uncivilized and savage, little more than predatory animals. For more on the subject, see Native Military Names Assuage Guilt.